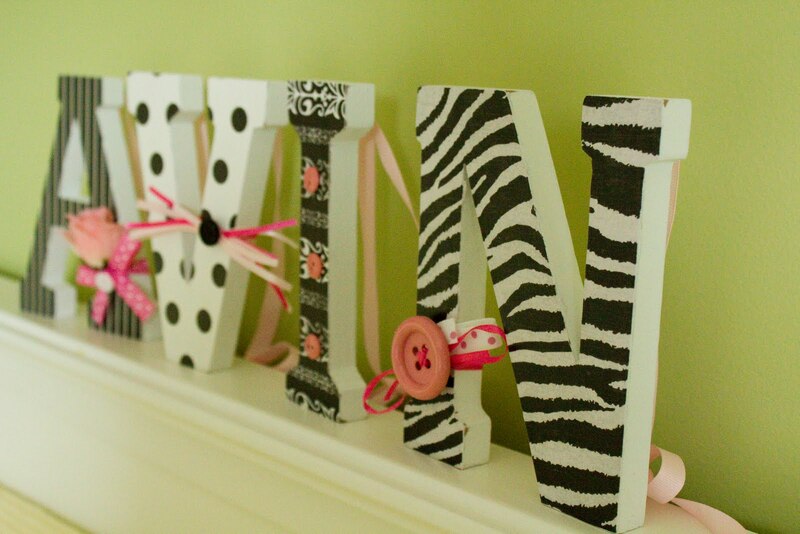 Dwelling specializes in custom wooden letters for the nursery, kids' rooms, showers, gifts and home. 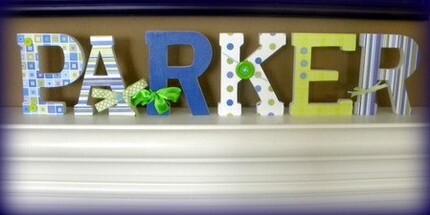 Dwelling can design and create letters to match any decor! Here are some of the names that she has done that I just adore. Her work is amazing, when I first got in contact with her I knew I wanted to have her make something for Avins room with her name on it. After looking over all her letters that she has done I decided to go with the color scheme of black and white with a touch of pink. I wanted something fun, a little modern with a touch of girl. Avins room has no pink in it but I knew once she got older her room would change. To be honest I am hoping there is no green in her room the next time we do it so I wanted to stay away from trying to match her bedding. Kelli at Dwelling lets you pick the colors and the patterns and also allows you to give any other input you might have. It makes it super fun and she makes it super easy. She asks for your ideas and then she puts your ideas and her magic to work. I absolutely love Avins name. I adore the color scheme, I love the little touches to each letter that she put on there and I love that the letters stand up on there own. 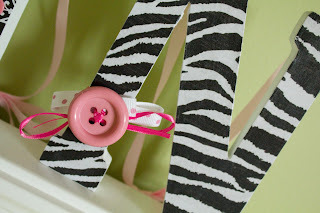 When I first contacted Kelli I had planned on hanging these above Avin crib, but when I saw them I changed my mind and decided that I would use him on her changing table for right now and they will eventually end up on her desk or a dresser. I think they are the perfect size to be on a desk or dresser. 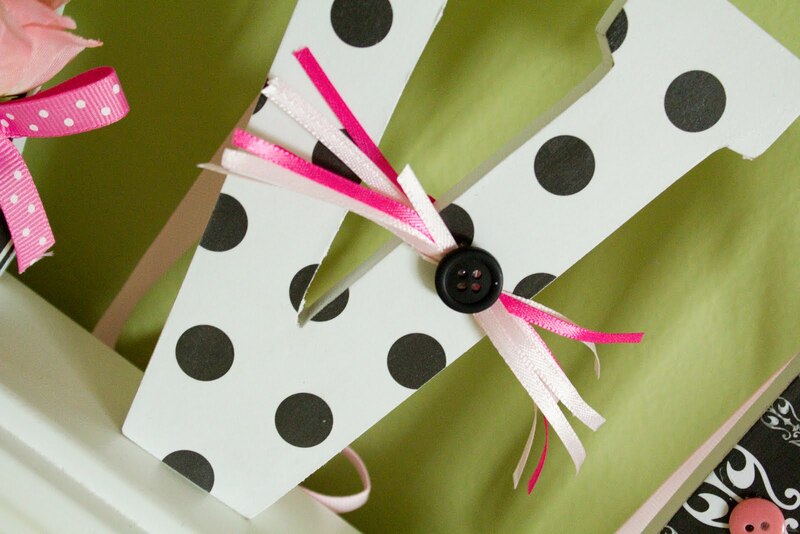 But each letter does come with a ribbon attached so that if I do decide to I can hang them at any time. Very, very convenient as I change my mind alot! And because Kelli is so nice and I just love what she has made for me she has offered you all a chance to win 1 letter of your choice that will follow in the black and white scheme. You can pick the A, V, I or N and decide what color accent you would want on it. 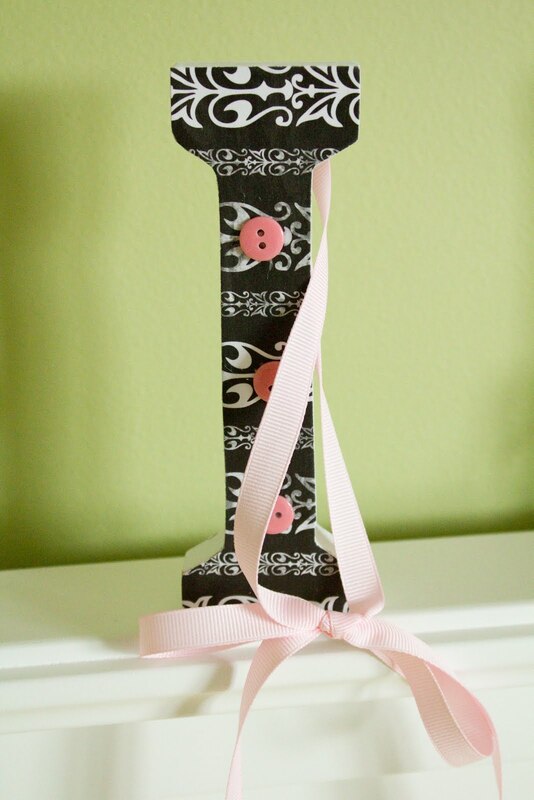 So if you are interested in a cute letter ( with the black and white color scheme) to place on a desk, bookcase, dresser or anywhere you please enter to win. I know you will love your letter if you win!! 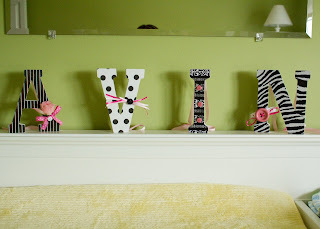 Just head on over to Kelli's shop Dwelling Custom Wooden Letters and Home Deco r and tell me your favorite name or letter she has done and why. This is MANDATORY TO ENTER! 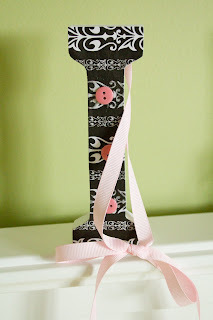 1 extra entry - follow my blog or let me know that you follow my blog. 10 extra entries - buy something from kelli and tell me what you bought. This giveaway will end on Tuesday, May 11th! I will choose the winner at random.org! I really like the letter K its decorated in an adorable black and white pattern and embellished simply with lime green buttons. I would probably get it in an "A" cause that is the first letter of my name. I have also made her shop my favorite. And I'm loving the big green J. The letters she did for Avin are adorable. I love them. She did a great job. I love the H she has done with the different color polka dots on it. So cute! I love the 9" pink "A"! How creative! 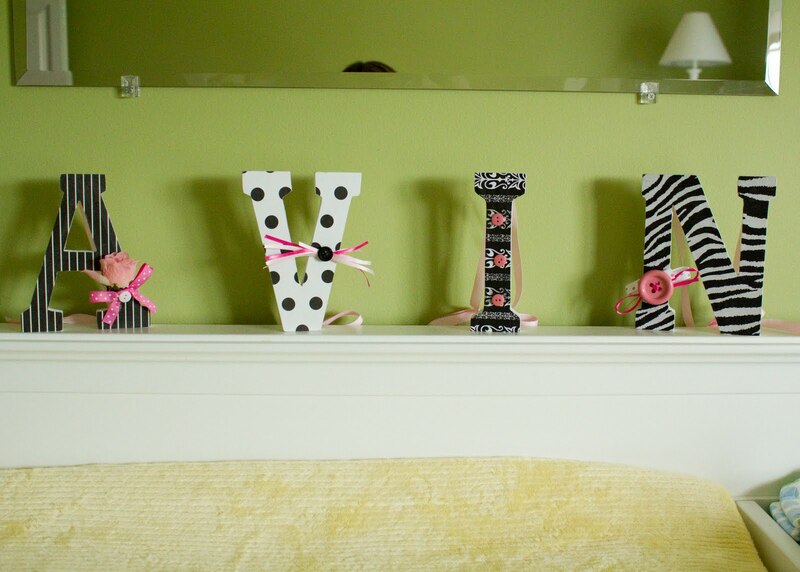 Can I say that I love how she did Avin's name because it's by far my favorite :) and of course I'm partial to A!!!! Love these! 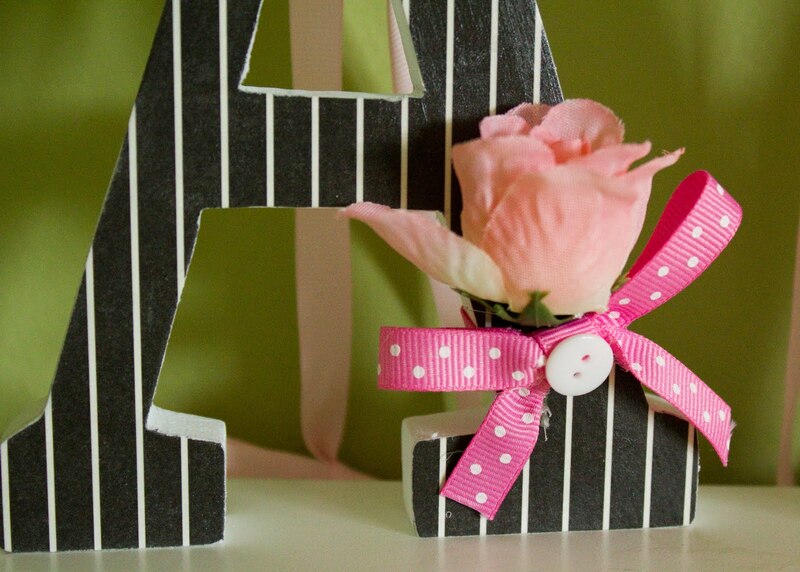 I love the black and white theme...it goes with anything and you can always add ribbons for color! Such great ideas...I love Avins! I love the 9 inch custom wood letter in zebra because my 11yo daughter would be wild about it! Hello! I am anew follower of your blog! 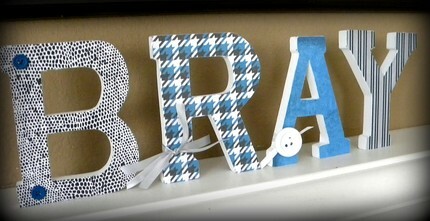 My favorite of the letter is "aiden" - but they are ALL super cute! Made Dwelling a favorite on Etsy. Great shop! Your letters are awesome.. 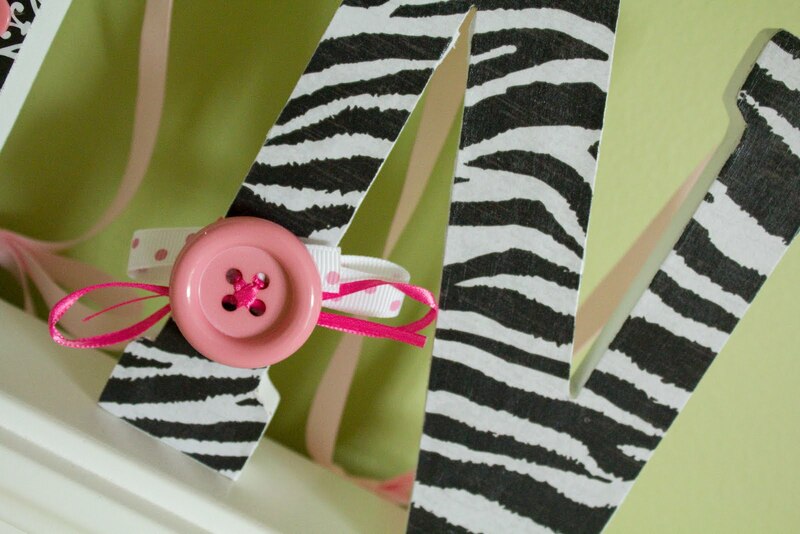 I love the zebra print letter, way cute!